For want of a sharp knife, many people consider cooking a chore. The difference between chopping an onion with a well-made sharp knife and a mass-manufactured dull knife is like trying to read a book in the dark. It’s slow going and frustrating with only a glimmer of comprehension. For anyone tasked with cooking the family meal, starting with a good knife will ensure that life in the kitchen will be good as well. But how do you know which knife to buy and how to keep it sharp? Enter Josh Donald, the owner of Bernal Cutlery in San Francisco who built a career out of sharpening knives, selling knives, and teaching people how to care for their knives. 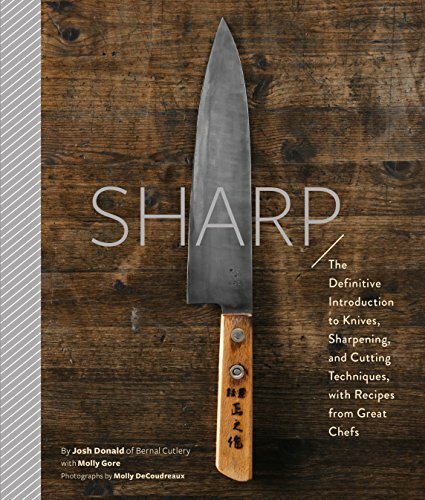 In Sharp, he passes on his knowledge to ordinary home cooks who can benefit from a little knife knowledge of their own. To be sure, there is some homework to be done. Knives, like everything else, have a history, and Donald will guide you through it with a fascinating look at the difference between European and Japanese knife-making techniques and the knives that are produced. From the workshops of K Sabatier in Thiers, France, to Solingen in western Germany, to the port city of Sakai, Japan, we meet the craftsmen who make the knives that make our lives in the kitchen more rewarding. How you sharpen and care for your knives differs according to East versus West as well. For this, Mr. Donald, who teaches knife sharpening in his cutlery store, takes the reader through a step-by-step guide that covers how to assess the edge, types of sharpening stones, and how to hold the knife when sharpening on a stone. While there are plenty of photos to accompany his sharpening instructions, there is no substitute for actually watching someone skilled who goes through the motions. It isn’t always clear exactly what the method is from reading and looking at the photos alone. However, this in no way diminishes the usefulness of the book. At a minimum it will get cooks to treat their knives with more respect, follow up with maintenance, and buy the best knives they can afford. Start by reading the book, then go to a reputable store that sells good knives and try out a few. How does it feel in your hand? How about the weight? And by all means, try it out on some vegetables in the store. Or take a peek at Bernal Cutlery online—it will put ideas in your head about a trip to San Francisco just to pay a visit to the store. As for the Great Chef recipes included in Sharp, well, let’s just say we should leave those for the professionals. In certain ways, after building us up with an even-home-cooks-can-do-this approach to knives and how to sharpen them, it was a real confidence buster to read the recipes and look at the photos of well-known professional chefs turning out recipes like Taka Tozawa’s San Mai Oroshi-Style Filleted Fish that includes four pages of written instructions and a two-page spread of photos showing how to breakdown a whole fish. Still, Sharp is a terrific reference book for any home cook or anyone interested in getting someone started in cooking for themselves. With graduations and wedding season upon us, getting someone a good knife or two would be a novel and lasting gift. Let Sharp be your guide.